From the Czech Republic comes high quality pedicure tools for professionals and passionate individuals. Aveniro produces beautiful, long lasting crystal files for manicure and pedicure for the professional service market. Handmade with Czech crystal and chemically etched to produce a near unlimited lifespan filing surface that is highly effective; quickly and efficiently filing, shaping and polishing the free edges, yet gentler to the nails and less likely to cause splitting, peeling, tearing and breakage. These files are easy to wash and sanitize for safe, healthy use time, after time for years to come. Aveniro offers a wide selection of files. From small, laser etched files for fingernails to large, heavy duty files for the toughest jobs. There are plain, clear files, some created out of coloured crystal, embellished with photo-printing, hand painting, decorative etching and Sworovski crystals. I received three large, pink gradient files from their line. 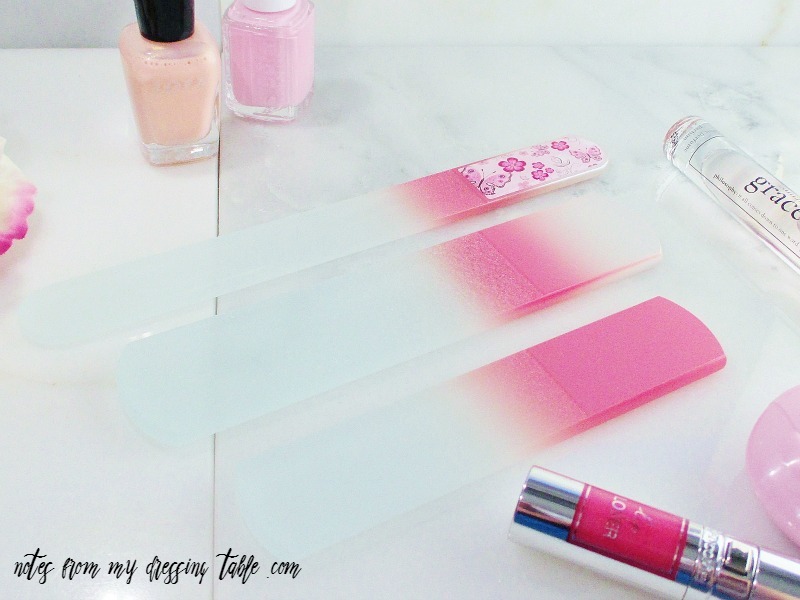 These files are too big and the filing surfaces are too strong for my delicate, special snowflake fingernails (I have crystal files that I have used and loved for years, for them) but these dual surface files are perfect for pedicures! First, I have the L42 Manicure File. This 7.5" long file is 4mm thick, strong and works beautifully for filing, shaping and smoothing my toenails. Unlike standard paperboard emery boards and grinders, which can cause damage as they file, the L42 leaves a very smooth, polished edge that won't catch or snag and looks and feels pretty and professionally finished. I adore the bright pink gradient colour and the photo-printed decoration on both sides of the handle end. 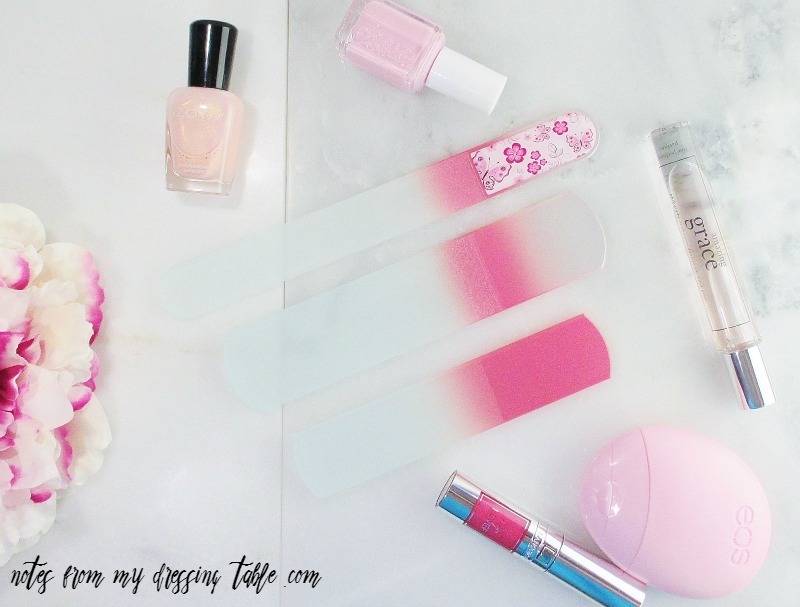 If you have strong fingernails for which you normally use one of the big, paperboard emery boards, you would love this file for your nails. The XL62R or, as I like to call it: The Callous Buster is a 6.5" x 1.5" x 6mm large, dual sided, deeply etched file that is just the ticket for smoothing away dry, rough skin and callouses. This file is constructed for heavy duty use. If you, like I have difficult to care for feet that dry out and form thick, cracked skin and callouses if you skip lotion, socks and pampering for even a few days, you will dig this bad boy! Finally we have the L62R, the smaller, easier going bestie to the XL62R. This 5.3" x 1/1/4" x 6mm file is perfect for lighter duty pedicure jobs, gently buffing dry, flaky skin off of the knees and elbows and even for nails, when used carefully. The L62R is great for travel. I like to use crystal files, for both fingers and toes by gently but firmly filing the nail to the desired length and shape then gently coax the "skin" from the back of the nail up and carefully bevel that away by running the file along the backside of the nail, back to front to remove it. Then, I carefully and lightly stroke the file on the finishing side, front to back across the free edge to smooth and polish it. 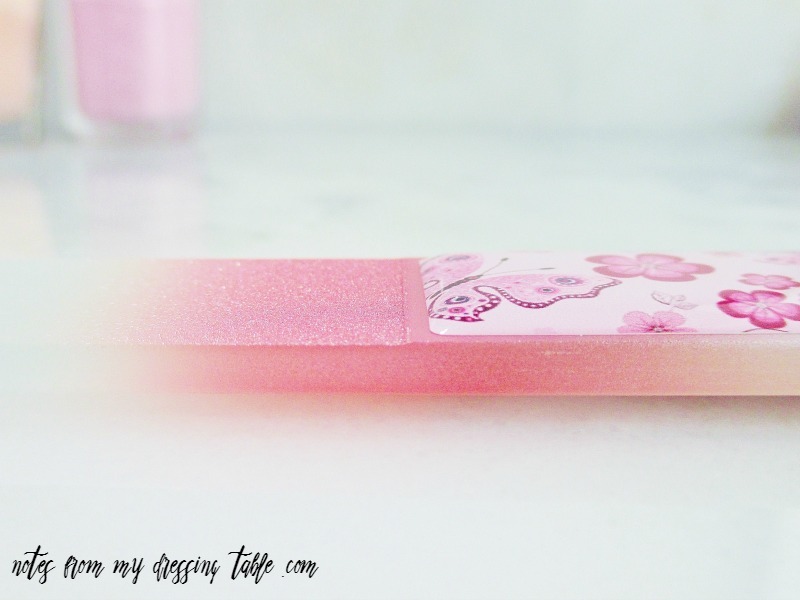 Using crystal files for years on my fingernails has greatly reduced the splitting and peeling I used to struggle with when I used standard emery boards or metal, diamond dust files. Each file comes in a vinyl slip case that helps keep them clean and protects them from knocking together, chipping or risking the filing surfaces. Pro tip: When shopping for crystal files for your manicure and pedicure needs, examine them very carefully as not all glass files are created equally. High quality, well made crystal files are hand created and chemically or laser etched to create lasting, effective and gentle filing surfaces. You will know that the file is etched by holding it horizontally. The filing surface will be "stepped down" from the handle area as in the file in the photo, above. Lower cost, cheaply made files are often manufactured of lower quality glass and rather than being etched are created by spraying a grit mix onto the filing surface, making the file less effective, gentle and subject to wearing out, very quickly. Usually within a few uses. It is easy to pick out those low quality files, as the grit surface is raised above the handle area. While the Aveniro files are sturdy and extremely well made, a little care is in order to avoid chipping and breakage. Don't drop or toss them on hard floors or other surfaces and when using them, don't bare down too hard. I broke a beautiful, name brand crystal fingernail file, years ago where the handle met the filing surface, by putting too much torque on it while wiping nail dust off of it. If you are filing rough skin on your tootsies and are putting a lot of pressure on the file, it could possibly snap and cut you. Don't worry about it, just use your noodle. Aveniro sells to salons and spas but I can't find a retail outlet for the public. I have seen some of their fingernail files listed on Amazon but as of this writing, I couldn't find any listings, available. I hope that this range will be available for sale to the public, very soon! I like the pedicure files I received and I would love to acquire some fingernail files, as well. Maybe some of the Sworovski decorated ones; they are so pretty. You can visit Aveniro on Facebook. 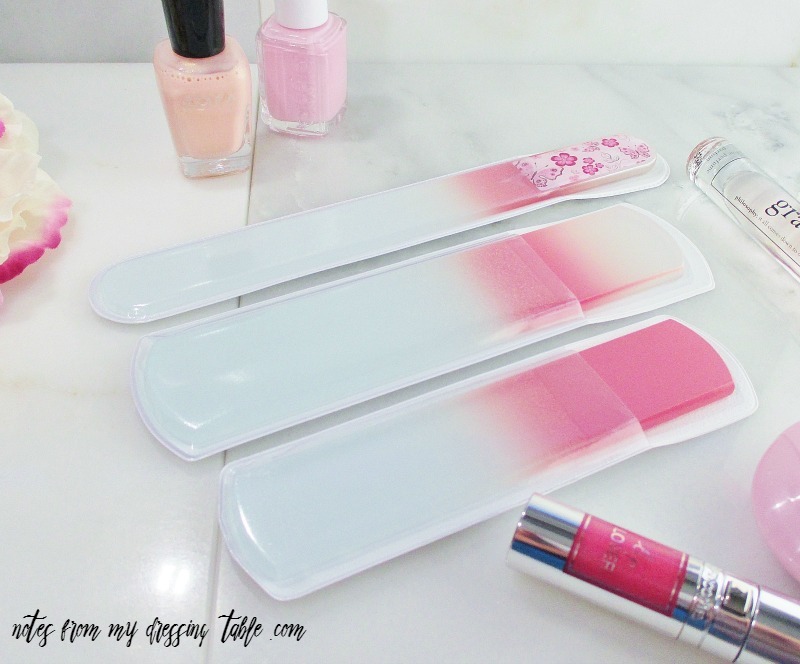 Do you use crystal files for your manicures and pedicures?